Our mobile payment app, meterUP, is rolling out city-wide! 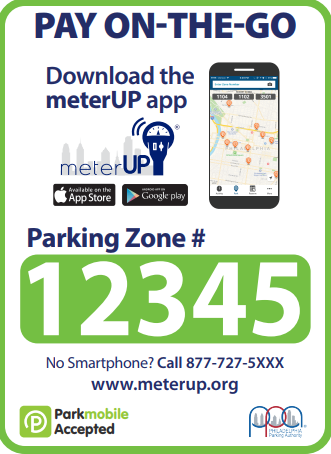 Let’s jump right into it: On December 11, 2017 our mobile parking app, meterUP, went live, allowing visitors and residents to conveniently pay for parking from the palm of their hands. 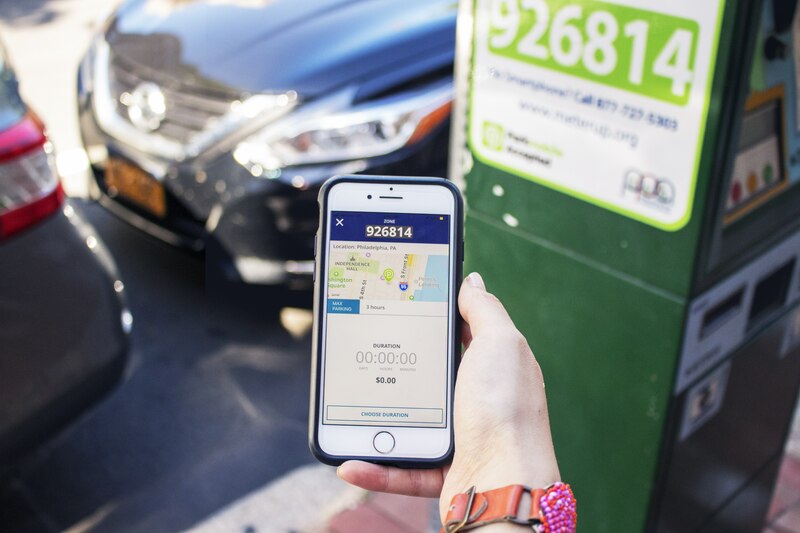 Now let’s get into the full details: meterUP not only offers the convenience of paying for parking from any phone, it also offers many other features such as being alerted when your parking session is about to expire! For the complete run-down on meterUP’s features and what to expect, check out the FAQs below. And remember: Before paying for parking with meterUP, make sure you keep an eye out for these signs. Go to your smartphone’s app store, download and install the meterUP application. meterUP is available on iOS and Android devices. Call toll-free 1-877-727-5303 and follow the prompts for personal assistance. After creating a meterUP account, simply open the app and enter your parking zone number, which is located on meterUP signs, kiosks and meters. The meterUP signs will look like this. Select your desired amount of time to park. Confirm your information then press the “Start Parking” button and you’re good to go! Question: Where can I pay for parking with meterUP? Answer: meterUP payments are accepted on streets with posted meterUP signs. Answer: Yes! You can call 1-877-727-5303 and follow the prompts to pay for parking.. Question: What payment methods are accepted in meterUP? Answer: The meterUP app and many of its features are free of charge, but, to pay for parking you’ll need to confirm a payment method. During the sign-up process, You can select credit/debit cards, Parkmobile Wallet, Visa Checkout and MasterPass as payment methods. Additional information can be found here. Question: I park at a location before parking regulations go into effect. Can I pay beforehand? Answer:Yes! If you park at a location before posted parking regulations go into effect, you can start a parking session. You will only be charged during the hours in which posted regulations are in effect. NOTE: If you park at a location at 7 a.m. but payment isn’t required until 8 a.m., you are able to make a prepayment at 7 a.m.. From there, you will only be charged from 8 a.m. until your parking session ends. Answer: Yes! One of the great features of meterUP is customized parking notifications. To set up your customized notifications, go to the “Notifications” tab in your meterUP profile. Answer: Once you receive a reminder that your parking session will expire, you can extend your time up to the maximum posted time limit. Simply click the extend button in the app, or call 1-877-727-5303 after you have started a parking session. Question: What’s with this 40 cent convenience fee? Answer: The 40 cent convenience fee is meant to ensure continued functionality of the meterUP app. The 40 cent convenience fee is applied whenever a transaction is completed within the app. This includes starting and extending parking sessions. Question: I heard I can pay with meterUP at select SEPTA train stations. Is that true? Question: How do I obtain a copy of my meterUP receipt? After opening the meterUP app, click the “Activity” tab in the bottom left corner. This will provide you with your recent parking transactions. Receipts can automatically be sent to the email address registered to your meterUP account. Just go to the “Notifications” tab in your meterUP app profile to enable the “email receipt” notification. Question: Is my account and credit card information safe? Answer: The meterUP system, provided by Parkmobile, a PCI Level 1 datacenter, utilizes industry standard encryption methods to ensure details (name, credit card number, etc) are stored using strong encryption algorithms. Additional information can be found here. Question: If meterUP is experiencing technical difficulties, does that mean parking is free? Answer: In the event of technical difficulties preventing payment through meterUP, the parking fee must be paid at the closest meter or kiosk. Answer: The meterUP service is provided by Parkmobile, LLC. For assistance with account management, you may call 1-877-727-5303 or contact the Parkmobile Help Center here.